As the month of March in Beijing bade farewell to winter and brought in the freshness of spring, so too China ushered in the new and innovative prospects of Lianghui. This term in Chinese is used to describe the annual sessions of the National People's Congress (NPC), China's top legislative body, and the Chinese People's Political Consultative Conference (CPPCC) National Committee, China's top political advisory body, that gather for the country's foremost political event. 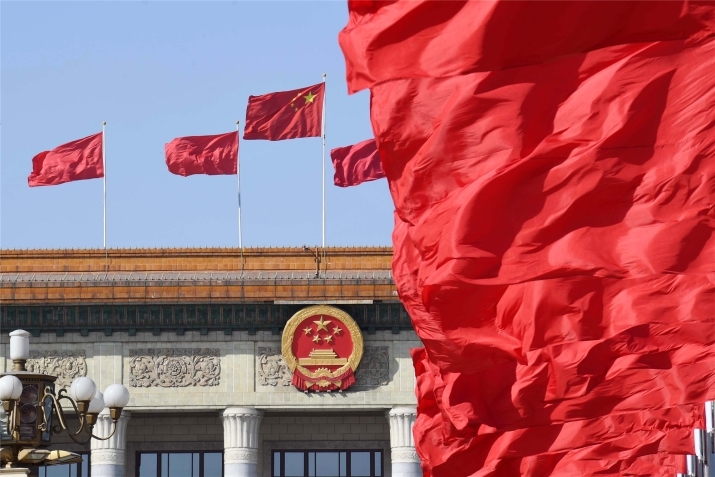 People at home and internationally pay close attention to the two-week long meetings that took place this year at a crucial time for China's politics and economy, in which the country's development is the issue of the greatest concern of the Chinese people. On March 5, Premier Li Keqiang deli-vered the Report on the Work of the Government. The premier affirmed the progress that China made in 2018 amid the profound challenges and changes in the external environment. He also indicated many "excellent signals" to boost the economy and improve people's livelihood in 2019. According to the report, the growth rate for China in 2018 was 6.6 percent, slightly higher than the projected 6.5 percent, and the total size of the economy reached 90 trillion yuan ($13.31 trillion). China set its GDP growth target in 2019 at between 6 and 6.5 percent, slightly lower than last year but still within market expectations. At the provincial-level Lianghui that preceded the national event, the majority of Chinese regions also lowered their GDP growth targets for 2019 and stressed transition from high-speed growth to high-quality development with promises to nurture new industries and upgrade traditional ones. "Now China has little advantage in the low-end industrial chain, which urges us to move to the middle and high end of value chains," said Chen Dongqi, head of the Macroeconomic Research Institute of National Development and Reform Commission. "In this process, the country must deal with the slowdown in economic growth and proceed with external challenges and difficult structural adjustments." The upgrading and transition of state-owned enterprises (SOE) play a leading role in China's high-quality development. In the past, regulators always focused on the scale of a SOE's revenue, but in the next phase, more attention will be placed on SOEs' return on areas such as net assets, revenue margin, investment on research and development, and added value. This will mean a SOE will not only be a leader in terms of revenue scale, but also lay emphasis on development quality and efficiency, according to Weng Jieming, Vice Minister of the State-Owned Assets Supervision and Administration Commission (SASAC). Although faced with difficulty in transition, Xiao Yaqing, Minister of the SASAC, has confidence in SOEs' reform and development, saying that in 2019, operating revenues of SOEs in China increased 3.9 percent year on year from January to February, and profits were up 15.3 percent in the same period. North China's Shanxi Province has set the standard in this transition. As a coal-rich region, in the past three years, the pro­vince mined 88.4 million tons of coal and sped up new energy and new materials development. An example is that Shanxi Uni-moon Green Paper, subsidiary of a coal-industry SOE, has developed a technology to manufacture paper out of coal-production waste. By producing an annual 120,000 tons of paper, the company could save 2.4 million trees. Yan Linhu, Deputy General Manager of the company, spoke highly of the move toward a more innovative and healthier development model. "The coal industry is under a lot of stress, but it's a positive sign that all companies are seeking changes," he said. Though downward pressure on the Chinese economy has worried global investors, according to the government work report, a series of new economic drivers have emerged that are expected to underpin the country's long-term prosperity. "China is still in an important period of strategic opportunity for development and has ample resilience, enormous potential and great creativity to unleash," said Premier Li. In 2018, China saw more than 18,000 new businesses registered on a daily basis, many of which are Internet startups. China's digital economy is expected to exceed $6 trillion by 2020, according to a report published by CCID Consulting, a leading research, consulting and IT outsourcing service provider in China. "New growth drivers are now profoundly changing our mode of production and way of life, creating new strengths for China's development," said Premier Li in his government work report. According to Pony Ma, Chairman and CEO of Tencent and an NPC deputy, the development of the Internet industry will also foster the growth of traditional sectors and help the high-quality growth of the real economy. "Internet companies will be fully integrated with, and transform industrial value chains, boosting resource allocation efficiency and serving the high-quality development of the real economy," he said. Apart from being an engine of economic development, technological innovation also plays a big role in improving people's livelihood. Twenty-five provinces, municipalities and autonomous regions nationwide are testing 5G networks, according to Zhang Yunyong, President of the China Unicom Research Institute and a member of the CPPCC National Committee, and smartphones capable of delivering 5G speeds will be available in the second half of this year. Zhang said the 5G smartphones are projected to hit mass adoption production in early 2020. According to him, 5G smartphones offer download speeds considerably faster than 4G devices. It needs only three seconds to download a 1 GB movie with 5G. "5G technology is changing our society and transforming industries. It meets people's demands for a better future and helps China head to a high-quality development future," Zhang said during an interview on the sidelines of the Lianghui. Apart from the excitement of emerging innovative economies, attention was also given to how a company's economic growth and environmental protection could go hand in hand. During a panel discussion of CPPCC National Committee, Wu Gang, Chairman of Xinjiang Goldwind Science & Technology, China's largest wind turbine manufacturer, spoke about how his company carried out new installed capacity last year. After the going green transformation, the company saw not only lower costs but also more deals with international customers. His company's experience shows that green development, like wind turbines, is not a constraint to economic growth. In fact, environmental protection itself can be a very promising field for investment. "If you talk to our customers, you will find they are not only interested in the quality of the products but also in how we manufacture these products," Wu said on the sidelines of the Lianghui. The company has remained one of the top three global wind turbine manufacturers for six straight years with the help of its eco-friendly equipment. According to the government work report, green development is a critical element in modernizing an economy and a fundamental solution to pollution. The government will unveil a series of measures to strengthen green and environmental protection industries to create a beautiful and livable environment in China. In 2019, China plans to reduce sulfur dioxide and nitrogen oxide emissions by 3 percent, while making continuous efforts to reduce the density of PM2.5, a major particle pollutant, in key locations, including the Beijing-Tianjin-Hebei cluster, the Yangtze River Delta region and the Fenhe-Weihe River Plain area. Lei Jun, Chairman and CEO of Chinese smartphone maker Xiaomi Corp., and a member of CPPCC National Committee, applauded after hearing the work report. 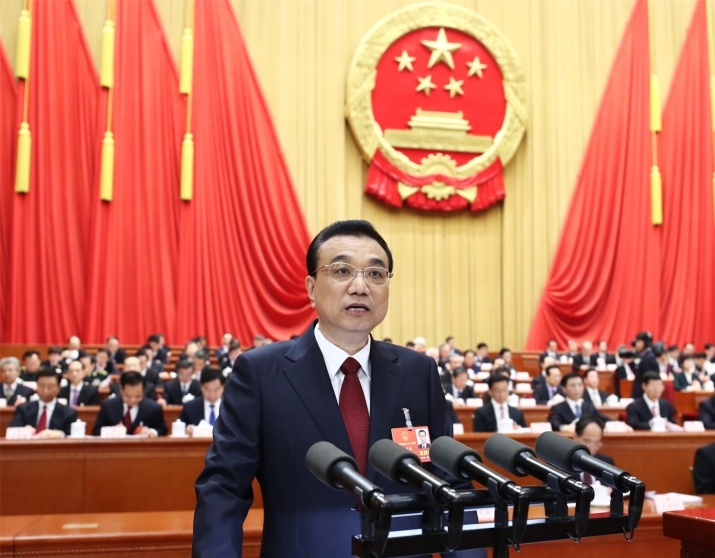 What made him so excited is that in the report, Premier Li announced that to better lighten burdens on companies, especially small and micro businesses, the government will reduce value-added tax (VAT) by 3 percentage points in 2019. This will come about from cutting VAT from 16 percent to 13 percent, and local governments will reduce employer's contributions to the worker's basic endowment insurance to 16 percent, totally amounting to nearly 2 trillion yuan ($298.3 billion). "Cutting taxes will inject new vitality into companies, boosting their enthusiasm to innovate. And it's likely to ignite a new creativity boom," said Lei. Private enterprises play a vital role in China's economic development, contributing 50 percent of fiscal revenue, 60 percent of GDP, 70 percent of technical innovation, 80 percent of urban employment, and 90 percent of total enterprises and newly-added employment, said Liu Shijin, former deputy head of the Development Research Center of the State Council. However, according to the National Bureau of Statistics, the industrial profit of private enterprises in December 2018 dropped by 1.9 percent from a year earlier, worsening from a 1.8 percent drop in November. Against the backdrop, the aggressive tax reduction policy is timely. Cheng Shi, Chief Economist at ICBC International, said that bigger-than-expected steps to cut taxes can help private enterprises move upward in the global industrial value chain and better deal with temporary difficulties. Zhou Bajun, a senior research fellow of China Everbright Holdings, said this policy is not only beneficial in stabilizing growth of enterprises, but also in the employment market. This year, for the first time, the employment-first policy has been elevated to the macroeconomic policy objectives, in order to ensure employment for key demographic groups, including college graduates, migrant workers and retired military personnel, as well as those living in poverty. Employment is the cornerstone of well-being and wealth. Maintaining stable growth, first and foremost, requires strong employment. "With stable employment and increasing incomes, we can continue to be fully confident," Li said in the government work report. According to Zhang Jinan, Minister of Human Resources and Social Security, in 2018, China created about 13.61 million urban jobs, an increase of over 100,000 from 2017. The registered urban unemployment rate had also declined to 3.8 percent by the end of 2018. However, the country still faces continued employment pressure with its workforce of around 900 million people. Also, employment prospects and job security are not only concerns for job seekers, but also for employers who may face imbalances in talent supply. According to Premier Li's work report, the country will implement a vocational skills training initiative, and allocate 100 billion yuan ($14.9 billion) from the surplus in unemployment insurance funds to provide training for over 15 million people. In addition, China will expand scholarships and grants for vocational college students, raise the level of financial assistance and speed up work to align vocational technical grade certificates with academic credentials. One of the most important topics under discussion at this year's Lianghui was poverty alleviation. Yang Fengji, deputy head of Da'an Township in Hainan's Baisha Li Autonomous County, had much to say on the topic, having worked at grassroots level for more than 30 years. Located in the central mountainous area of Hainan Province, Baisha Li Autonomous County was classified as a "poverty-stricken county" at the national level. In Tianbiao Village, where Yang lives, the per-capita annual income of villagers was less than 600 yuan ($89.4) in the past. However, by growing rubber trees, the per-capita annual income of villagers today is about 9,000 yuan ($1,341.3), and almost all of them have been lifted out of poverty. The county's story of poverty reduction is just one of many examples in China. Via its reform and opening-up policy that has now lasted for over four decades, China has been able to lift 800 million of its citizens out of extreme poverty, according to the World Bank. This achievement is inseparable from the great importance attached to it by the Central Government. Poverty reduction has been a recurring topic for President Xi Jinping during his speeches at panel discussions at the annual Lianghui in the past years. This year, while attending a panel discussion with deputies to the NPC from Gansu Province, Xi made a call for an all-around effort to achieve the ambitious goal of eliminating poverty in China by 2020. At the same time, he warned that "the practices of formalities for formalities' sake and bureaucracy hamper the effective advancement of poverty reduction," going on to stress taking a firm stand in rectifying malpractices in poverty relief. China has set the target to reduce the rural poor population by more than 10 million and take 300 counties off the country's list of impoverished areas in 2019, said Liu Yongfu, Director of the State Council Leading Group Office of Poverty Alleviation and Development.